When and how did you meet Chris and the Masters first time? I met Chris at a Masters of Reality show at the roxy in Los Angeles in 1990 . My friend was doing sound there and saw their soundcheck. He then called me and said I had to come witness their awesome fury. I was already a fan and owned the first album , so I jumped in my car and did indeed witness their awesome fury... We met and found we shared a love for many things besides music. What music influenced you most? Every kind of music works it's way into you soul , if it has soul. When do you start playing guitar and what says your parents and family? I started playing guitar when I was 15. my brother Jack , and my uncle David , always had very cool bands . Jack showed my some chords when he found out I had been sneaking his les paul out from it's case . My mother was raising me and was extremely supportive . She loved music and loaned my money to buy my first guitar and amplifier. I repaid her by doing lawn work . This year was your 50th Birthday, you celebrate this 3 days on stage. WOW. What feelings do you got now when you getting older, can you say I was the right way you go and you got a lucky and fulfilled life? Most definitely . I am the luckiest man in show business. I've always been able to do what I love most . I'm not wealthy financially , but I enjoy more freedom , and do more things I love , than almost anyone I know. I play with all my favorite musicians and rejoice in the life I lead . My birthday was a testament to that fact . Almost all my closest friends gathered in New Orleans to help me celebrate . Can you tell us a insider- or funny story about your time with Chris or the Masters? Not really . There have been so many . All my time with chris as a friend and musician , have be amazingly fun and rewarding . All 21 years of it . Chris is really one of the funniest people I know. And the most talented . The best producer around . He really gets into the songs , playing and singing . he knows his stuff !!! Whats your favourite dinner and drink? My favorite dinner and drink is with my friends . It doesn't really matter what we eat or drink, as long as we are together. I love food and drink, that should be obvious!!! It's hard to narrow down to my favorite anything ..I pretty much love everything!!! . You are a multitalent, whats your hobbies beside music and cooking? Why , thank you ! I love traveling , hosting parties , photography , halloween and mardi gras. That's why I love being a musician. I get to do all my favorite things all the time . Do you know some of the old songs did with the Masters before Rick Rubin produced them? Yes I do ! Chris has played me almost everything he's recorded . There are some wickedly astounding songs in his songbook !! 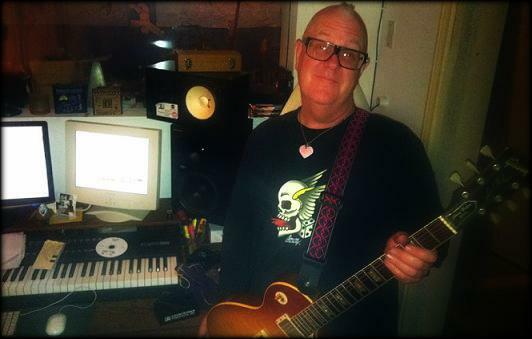 2008 Chris started to record Pine/Cross Dover at the Rancho de la Luna, what do you think it´s time to talk with Chris about a new Masters album for 2012 (I swear he got thausands songs in the tube, in his mind and on his little tape recorder)? I do indeed !! It's difficult to get everyone together sometimes, but it is that time !!! Whats up with the Goon Moon recording on the Rancho this year, saw Jeordie playing on the banjo? We always have an awesome time when we record goon moon at rancho. Everyone is extremely funny and talented , and that makes for the best time possible. We're all very good friends and enjoy each other's company and music. Hopefully , Goon Moon's new material will be released soon . 30 Years Masters of Reality, whats your comment? I hope for 30 more years!!! Like bluesmen , I think we can keep on going til we die . All the best to you Thomas!! !